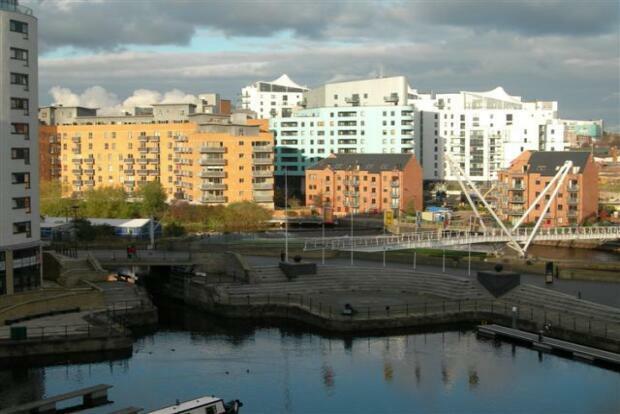 2 Bedroom Apartment To Rent in Leeds for £875 per Calendar Month. This light and airy apartment is offered furnished and comprises of a spacious hallway, open plan living space with modern kitchen benefitting from integrated appliances with a full sized fridge freezer and a dishwasher. The living space leads to a large balcony with double doors and beautiful dock views. Both bedroom are good sized doubles with double beds and plenty of storage. The master bedroom has the benefit of an modern and contemporary en-suite shower room with plenty of above sink storage and rain head power shower. The modern and fully tilled house bathroom has a full sized bath with shower and again plenty of above sink storage. Contract parking situated only a few minutes walk away is available at an extra monthly cost.